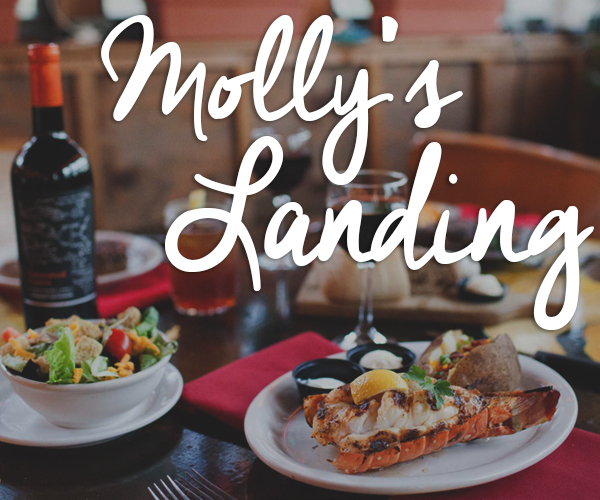 If you are fortunate enough to work at one of the restaurants in Tulsa that changes their menu seasonally based upon what fresh local ingredients are available, then you always look forward to the staff meeting where you get to sample every new dish on the menu. Juniper invited TulsaFood to attend their tasting meeting where Justin Thompson and Chef Tim Slavin’s kitchen team rolled out each of their new summer menu dishes, and we happily accepted the invite. The following are the summer dishes that there is still time to enjoy at Juniper Restaurant and Martini Lounge at 3rd and Elgin in Downtown Tulsa. 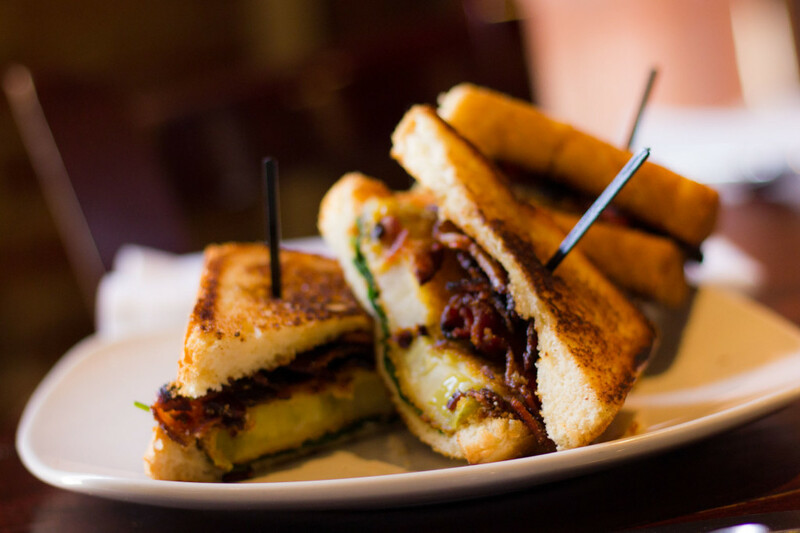 This sandwich is one of the big time highlights on the lunch menu. 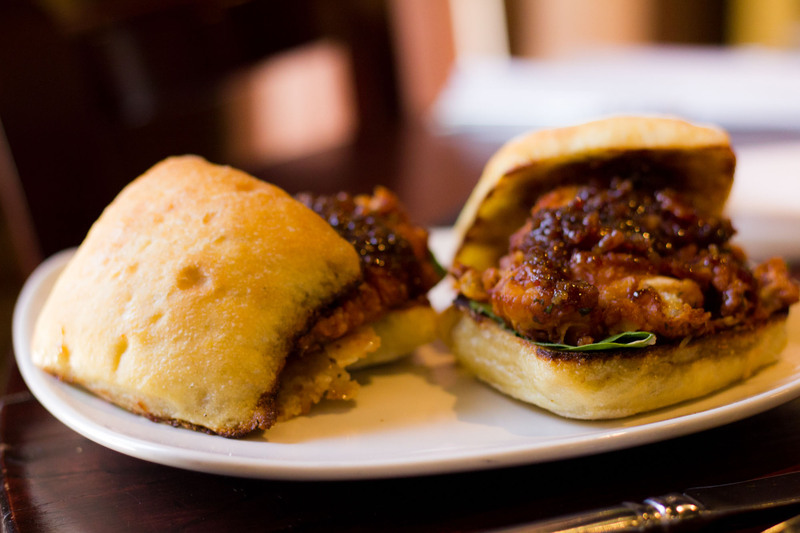 The chicken is golden fried goodness on the outside and tender, juicy perfection on the inside. But it is the combination of the pickled shallots, strawberry, and bacon jam that really set this sandwich off. And we loved the decision to put this on fresh ciabatta. Who doesn’t love a great chicken salad sandwich on a hot summer day? If any sandwich can be described as ‘refreshing’ in the summer this is it. Chef chars then dices the red onion, roasts and strips the corn, chops the roasted chicken, then combines it all with some cumin and cilantro and serves it to you on ciabatta. 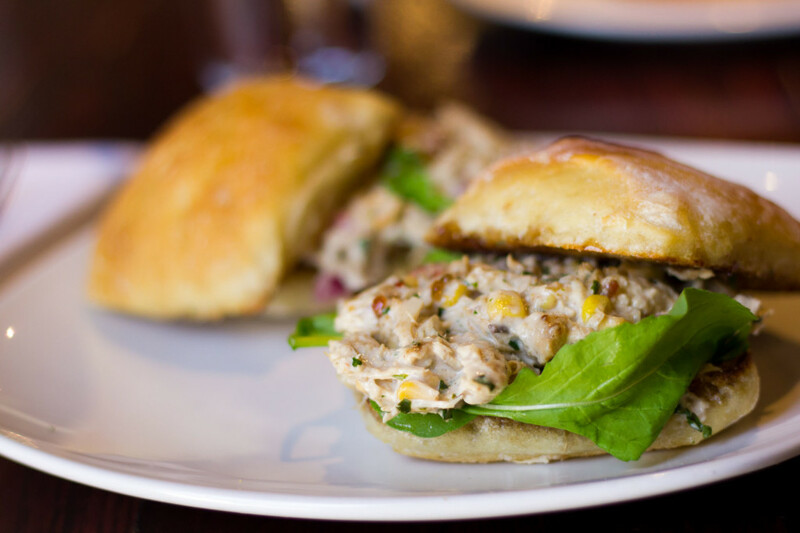 Simply stated: if you have ever liked a chicken salad sandwich in your life, it seem impossible not to love this one. 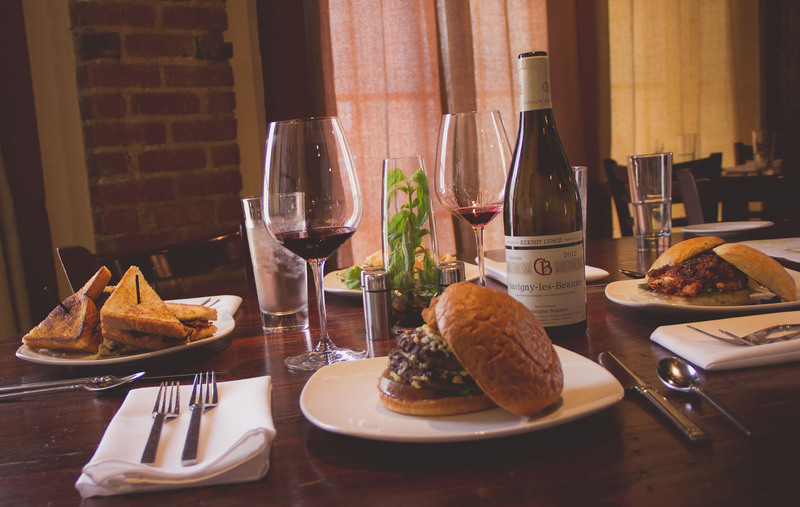 Tulsa is a burger town. So if you have a burger on your menu and you want to be taken seriously it better be good, and the Juniper burger is tasty and unique. It’s creative without being trying too hard to be different. The havarti cheese is melted on each of the two patties while still on the grill then placed together on sliced tomatoes and greens that are sitting on a fresh bun. 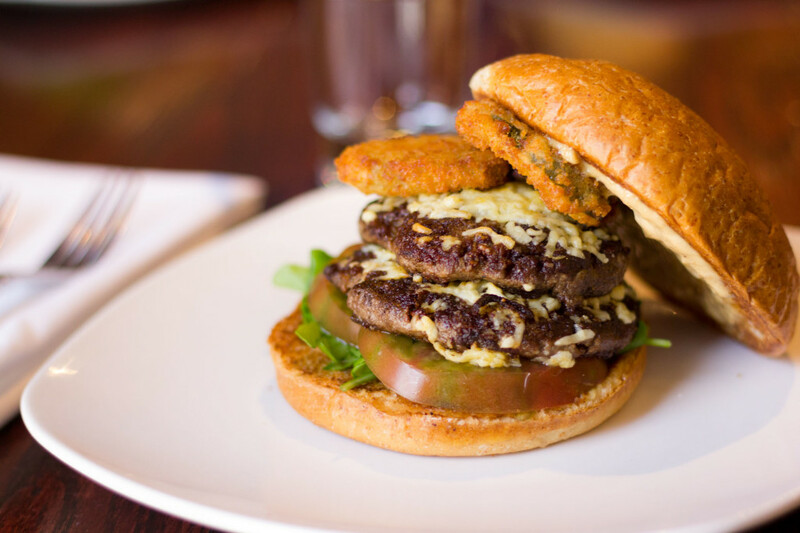 The bun is spread with a caramelized onion aioli and the final touch is the house made fried pickles that are added to the top of the double patty. Delicious! We love the various interpretations of Caprese that surface each year among Tulsa’s top restaurants. 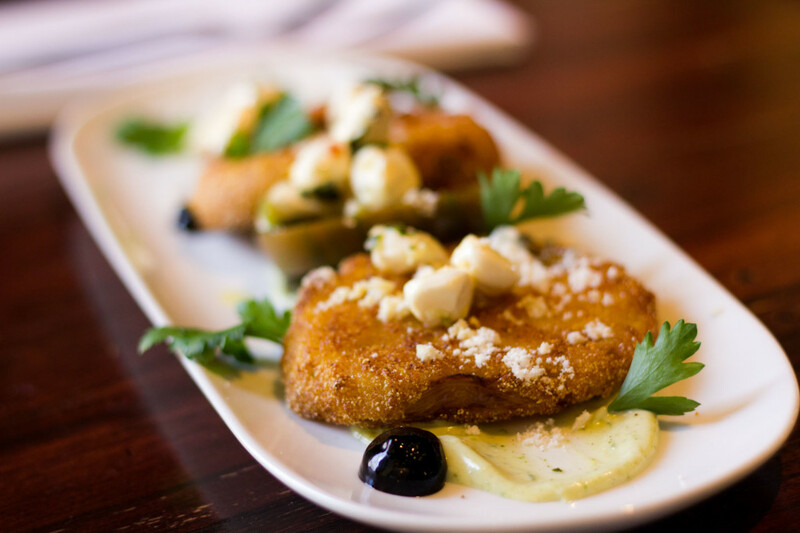 Justin’s creation has fried heirloom tomatoes sitting on a basil aioli topped with marinated mozzarella, olive oil powder and completed with a drizzled balsamic. One immutable fact about Justin Thompson restaurants (Juniper, Prhyme, Tavolo, 624) is that you can always count on the scallop dish to be special. We have ordered the scallops multiple times at each location and they have always been served at the perfect temperature (medium rare) with a delightfully seasoned seared crust – seriously, every time. 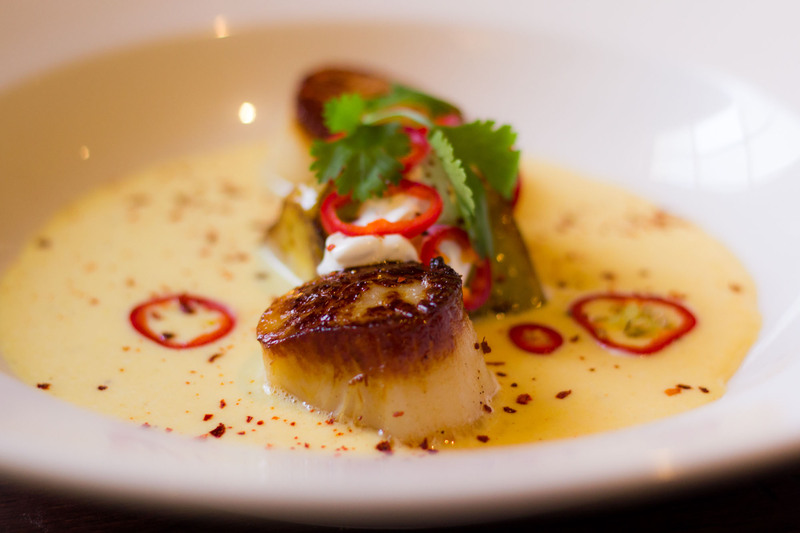 The scallops of this dish sit in a shallow and rich corn puree with caramelized sliced green tomatoes topped with a lavender crème fraÎche. Finally the artistically placed sliced fresno chiles give this dish it’s subtle ‘kick’. This style of salad that originated in France. 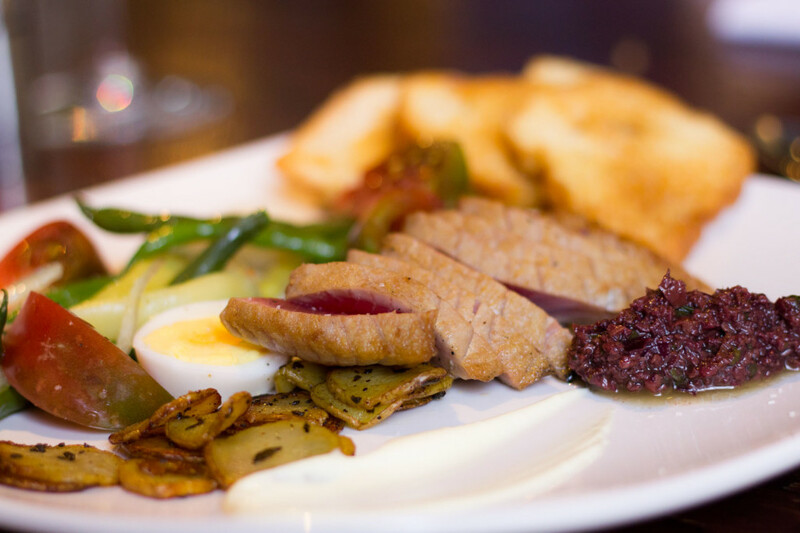 Juniper’s version contains the classic elements of Tuna (rare), hard boiled eggs and tomato but adds a savory olive tapenade, haricots verts, and fingerling potatoes with a roasted garlic aioli. Don’t miss this dish – It’s is packed full of balanced flavors and your body will say “thank you” for all the nutrients. If you are looking for a vegetarian dish with a little heat to it you have now found it. 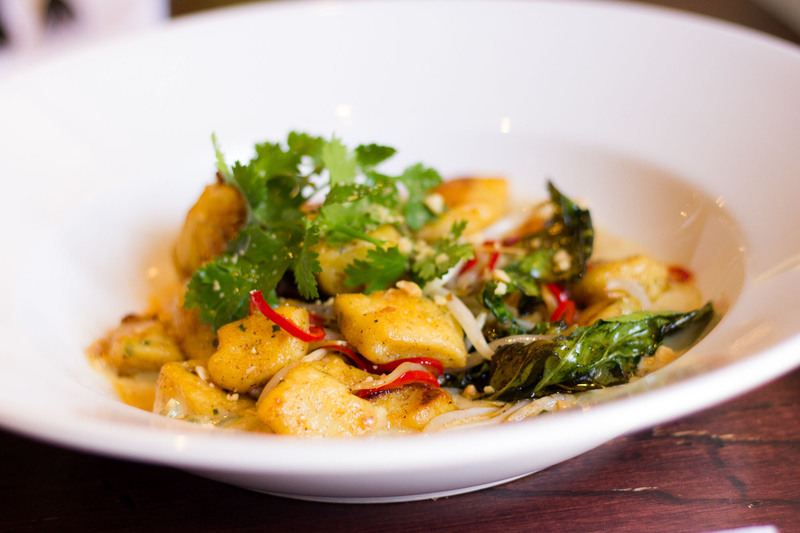 The gnocchi is tossed in a spicy coconut peanut sauce with fresno chiles, baby bok choy and bean spouts then topped with cilantro. You can also order the gnocchi as a side ($8) with your dinner entree. Your dining experience at Juniper will not be complete without this dessert. The cinnamon maple glaze caramelizes wonderfully, providing the golden crust of the cobbler. 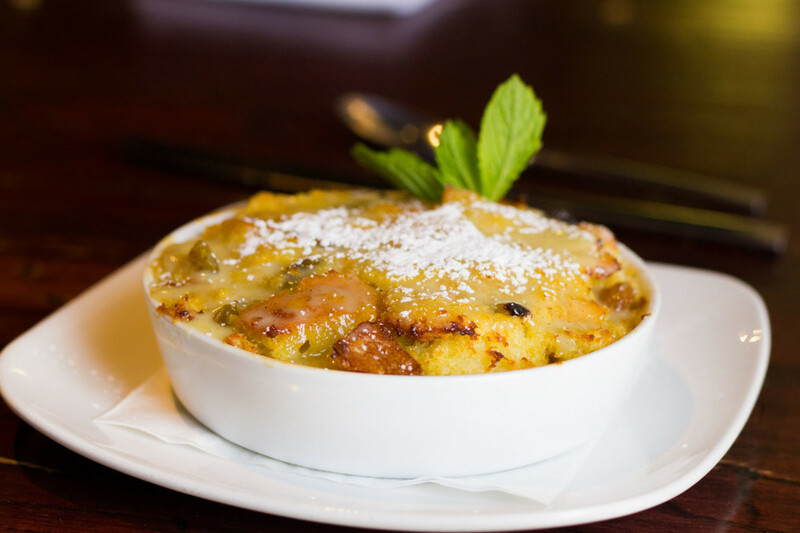 If you plan your dinner perfectly you will order this dessert when you order your entrees to make certain it comes to your table directly after you finish your entree since the cobbler takes 20 minutes to prepare.